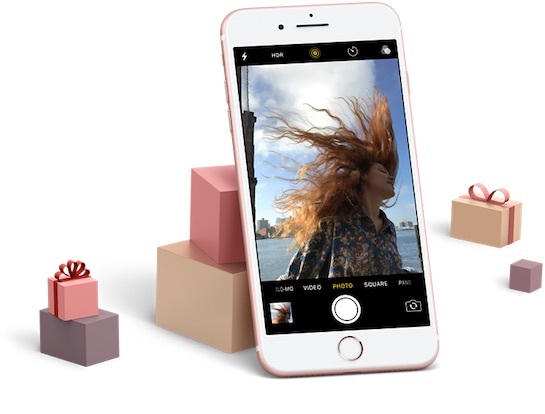 Apple has shared its annual holiday gift guide on its website, with product recommendations such as the 12-inch MacBook, iPhone, Apple Watch, iPad Pro, fourth-generation Apple TV, gift cards, and related accessories. The guide also points gift-givers towards various music products, photography products, games, and toys. This year's holiday gift guide is less sophisticated than in previous years, such as in 2015 when Apple split gift recommendations into six categories: gaming, photography, music, fitness, learning, and travel. Nevertheless, this year's list provides a basic overview of some of Apple's most popular products and accessories for those unfamiliar. • United States: Free two-day shipping on in-stock items ordered by 5:00 p.m. local time each day, and free next-day shipping on any in-stock iPhone. • United Kingdom: Free next-day delivery on in-stock orders over £40 placed by 19:00 local time each day. Free standard delivery for everything else. • Australia: Free next-business-day delivery to most metro areas on in-stock items over $250 ordered by 2 p.m. local time. Free standard delivery for everything else. • Canada: Free standard shipping on everything. • Western Europe: In countries such as France, Germany, Spain, and the Netherlands, Apple offers free next-day delivery on in-stock orders over €40 placed between 15:00 and 17:00 local time each day. Free standard shipping is generally available otherwise. Free shipping on everything is also available in Italy. Apple apparently really dropping the ball on those AirPods. They would have been a great holiday gift. Cool gadget at just a bit too expensive for many folks to buy for themselves. They would have "won" Christmas. Wow, "gift guide". They make like 6 actual product lines. Their "gift guide" is everything they make. Not original. Hope we get the 12 Days of Gifts app, I loved that Holiday spirit three years ago. I haven't read the Holiday Gift Guide yet, but I bet you there will be a few Apple products in there. I know how Tim Cook thinks. How about a SALE Apple?! You know, that thing when retailers REDUCE their prices... oh, never mind. Very pretty - but not much good when neither the new MacBook Pro's or iPhone 7 Plus models are in stock. I already have enough of the old stock thanks.